A wander through Little India will have you wondering whether you are in Delhi rather than Singapore. This most vibrant and colourful part of Singapore houses several spectacular temples and bustling shops selling everything from gold jewellery, to Hindi music CDs, cheap clothing and souvenirs. The restaurants of Race Course Road are popular with locals and visitors alike who flock here in search of a good quality curry. For an authentic Asian shopping experience, don’t miss the fresh food market stalls of the Tekka Centre. There are many beautiful temples to visit in Little India. As would be expected in the Indian centre of the city, several of these are Hindu temples – most notably the Sri Srinivasa Perumal Temple and the Sri Veeramakaliamman Temple, both situated along Serangoon Road. However, Singapore’s other religions are also represented here – with the staggering 15 metre high Buddha of the Sakya Muni Buddha Gaya Temple, the stunning Taoist Leong San See Temple and the Abdul Gafoor Mosque all worth a visit. Little India is the obvious place to head to if you are in search of a curry. Race Course Road and Serangoon Road are lined with restaurants, as are all the side streets in between. Be sure to try Singapore’s favorite curry dish – Fish Head Curry. The very popular Muthu’s Curry on Race Course Road is the self-proclaimed pioneer of fish head curry, while nearby Banana Leaf Apolo is equally busy with fans of this quirky dish. Other hits include Komala Vilas, famed for its cheap vegetarian dishes and Khansama Tandoori on Serangoon Road. Despite the fact that the streets of Little India continue to buzz after dark, the area isn’t really known for its nightlife. Life after sunset in Little India focuses around eating and shopping - there are a huge number of restaurants to choose from and the cramped little shops continue to blast out Hindi music and pull in the bargain hunters into the night. A couple of exceptions stand out for those in search of drinks and good times – backpacker haunt The Prince of Wales and trendy cocktail haunt Barkode. 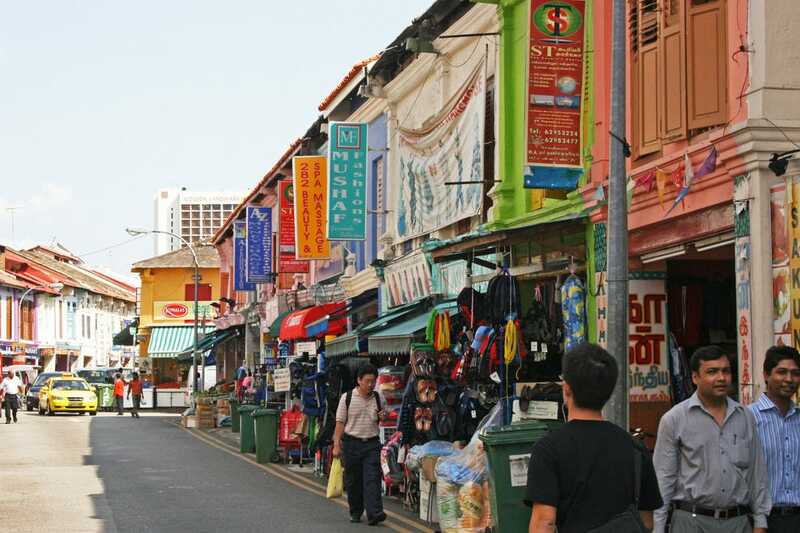 Little India is the number one location of choice for backpackers and budget travellers - its cheap restaurants, internet cafes and the excellent Tekka Market are a godsend to budget conscious travellers, and several cheap yet attractive hotels have sprung up here in recent times. There are several no-frills options to choose from, but one of the most popular is the trendy yet affordable hostel Hangout @ Mt Emily, which is sandwiched between Little India and Orchard Road. For something really memorable check out the boutique Wanderlust Hotel with its reasonably priced quirky rooms. The crowded shops of Little India are a bargain hunters paradise, selling everything from gold jewellery, to Hindi music CDs, cheap clothing and souvenirs. Be sure to seek out the Tekka Centre, a bustling wet market brimming with fresh fruit, vegetable, meat and seafood stalls. Also not to be missed is the staggering Mustafa Centre. This 24 hour shopping mall claims to have 75,000 items on its four levels, covering an area of 70,000 Sq.ft and to attract some 15,000 visitors every weekend. In short, it has a mind-boggling array of goods, generally at cheap prices.